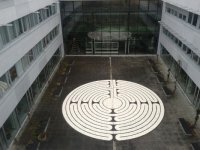 5793 labyrinths found. Showing 621-640. Sorted by country, state, city, then zip/postal code. 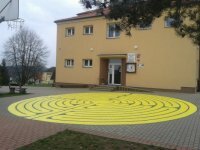 Portable labyrinth in the shape of a heart. Located in the middle of the park, in front of the wooden gazebo. 49 40' 54.95° Lat. ; 18 22' 2.358° Long. 11 Labyrinths in 1 place! Just 1 hour drive from Prague, the beautiful capital of the Czech Republic. Labyrintharium Loucen - 10 Labyrinths on 1 place ! Opening: January-April: weekends only, May-September: daily, October-December: weekends only. 50 17' 12.93"° Lat. ; 15 01' 27.75"° Long. 49 16' 38.541"N° Lat. ; 13 11' 46.573"E° Long. 50 3' 51.12"N° Lat. ; 14 25' 1.92"E° Long. A replica of the labyrinth of Chartres Cathedral. Located in the middle of the park forest. 49 40'39.479 ° Lat. ; 18 40'14.806 E° Long. 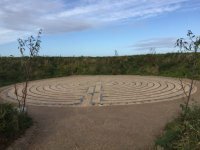 The labyrinth is a little difficult to find; it is marked on the overview signs in the park but no signs near the labyrinth. It is located north of the cafe; south of the nature playground. 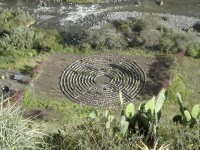 Note: recent reports suggest this labyrinth is now totally overgrown. N 55, 38', 34.7° Lat. ; E 12, 31', 10.6° Long. "The Maze" in Pile Alle is shaped like the label on a Tuborg beer bottle, the maze "walls" consisting of a lovely beech hedge. Check the website for opening times. 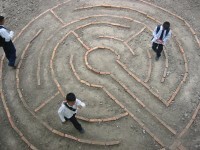 Labyrinthia is an amusement/activity park with a number of different labyrinths and mazes.